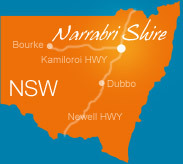 Narrabri Shire Council hereby notifies that the Ordinary Meeting of Council will be held on Tuesday, 27 November 2018, at the Boggabri RSL Club Meeting Room, 77-79 Laidlaw Street, Boggabri. The Council Meeting will commence at the later time of 2.00pm with the Public Forum. If anyone is interested in addressing a listed agenda item at the Public Forum, for the meeting on Tuesday 27 November 2018, please contact the General Manager on 6799 6833 before 5.00pm on Monday 26 November 2018. You will need to complete the “Request to Speak at Public Forum” form that is available on the Council website, and advise your name, address and the agenda item you wish to speak on, and the subject of your address.